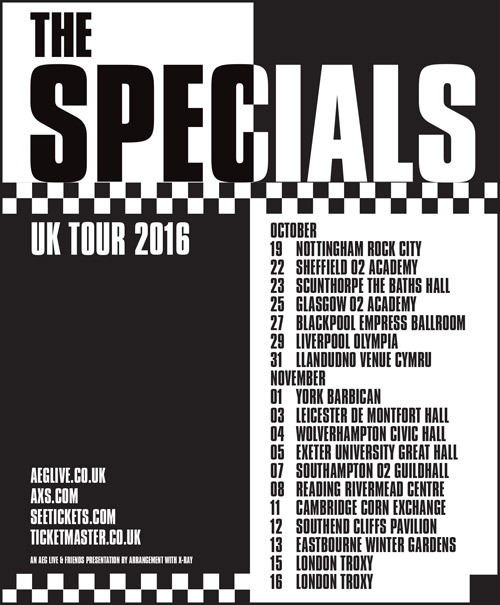 I missed out on The Specials first time around – I was still emerging from my Seventies Prog Rock bubble at the time, I think. I also eschewed attending a gig on the band’s 30th Anniversary tour of 2009. Indeed, I can recall castigating a work colleague who was going, telling her The Specials “without Jerry Dammers just would not be special”. But I felt if the lads were good enough to come and play on my doorstep, I really should make the effort too. A bit of pre-gig investigation informed me the reunited Specials had been hemorrhaging band members at an alarming rate since that reunion bash; with Neville Staple decamping across the Atlantic, Roddy Radiation (allegedly) stomping off in a huff about something and, tragically, drummer John Bradbury going off to join the Great Ska Supergroup in the Sky, in 2013, 2014 and 2015 respectively. Which leaves just three of the original band still performing – or to put it another way if you like, we were presented this evening with a group which was 57.14% tribute act. Singer Terry Hall remains, as does guitarist/vocalist Lynval Golding and bass player Horace Panter. were placed between the audience and the stage. They opened their set with Ghost Town, boasting a light show which would not have shamed a moderately successful second-rate Prog band from the Seventies – Barclay James Harvest or Greenslade say. But the lads had barely begun their second number Do Nothing when, as if impelled by the lyric of the opener, a fight broke out on the dance floor. Security quickly went in and calmed things down but Terry was not satisfied, informing security that the band would not carry on until "the fookin’ idiot" responsible was ejected. Which, after a bit of a stand-off, he was, to general acclaim. There was, I am pleased to relate, no more such nonsense, but I did wonder if the incident soured the evening for Terry Hall (who really must despair at having had to deal with this sort of idiocy for most of his career). For he barely interacted with us thereafter, other than to distribute some bottled water to one or two of the sweatier bods down the front. Seemingly remote from both his band mates and ourselves, he appeared more often than not to be singing to a spot on the floor a few feet in front of him rather than to the boisterous Alhambra pack. I also got the impression he, on more than one occasion, had to be persuaded by Golding to continue as he began to sneak in the direction of offstage. Now perhaps he is always like that, I don't know, but I thought it telling that the single encore we got was the instrumental Guns of Navarone (with Hall nowhere in sight), rather than the Enjoy Yourself/You’re Wondering Now performance other stops on the tour had been rewarded with. The main set list pretty much covered most of the bases on The Specials and More Specials albums, with a few non-LP tunes thrown in. 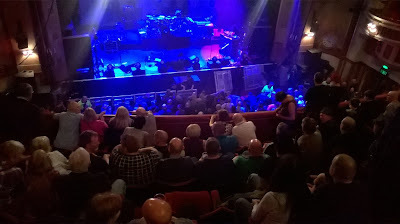 All were immaculately performed, and sounded just great inside the Alhambra which, with the stalls seating removed, bounced as it assuredly never did the last time I was in there; to see Billy Elliot – The Musical. I really must get along to more gigs in the place. A surprise highlight was Golding’s rendition of Bob Marley’s Redemption Song – it was so powerful I could overlook the fact he had to keep glancing at a lyric sheet in front of him. Lynval belts out Redemption Song. This chap - who I do not think is the band's usual drummer - stole the show.